Its name aside, Photoshop caters to a wide range of professionals, from designers and illustrators to forensic scientists and 3D animators. 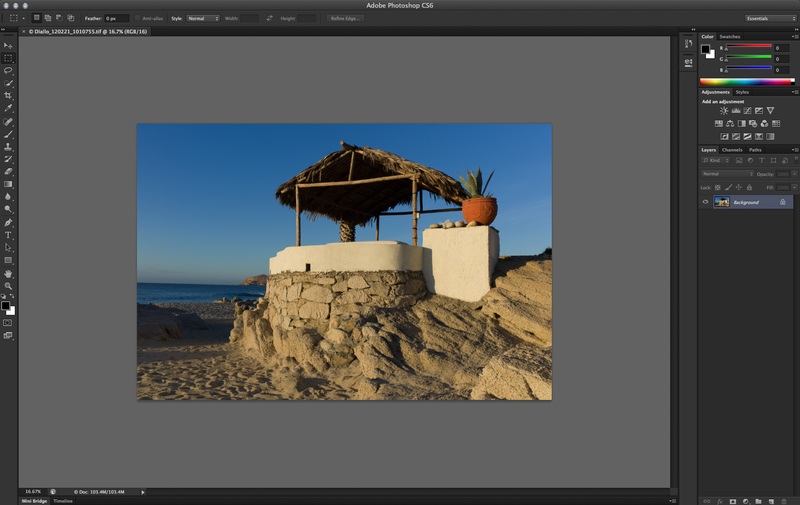 In this article we're going to introduce the CS6 features most relevant to Adobe's photography-based user community. As you'd expect, CS6 offers a number of new tools and functionality. Yet, the most immediate change for any previous Photoshop user is undoubtedly going to be the UI (user interface) redesign. 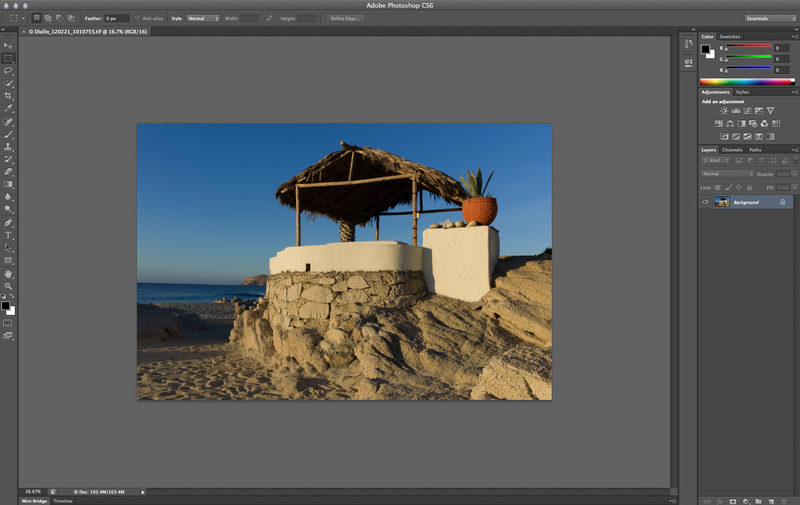 For the first time in 22 years, the team at Adobe has given Photoshop a complete makeover. Along with the more obvious changes you'll see below, roughly 1800 icons and 250 cursors have been redesigned. 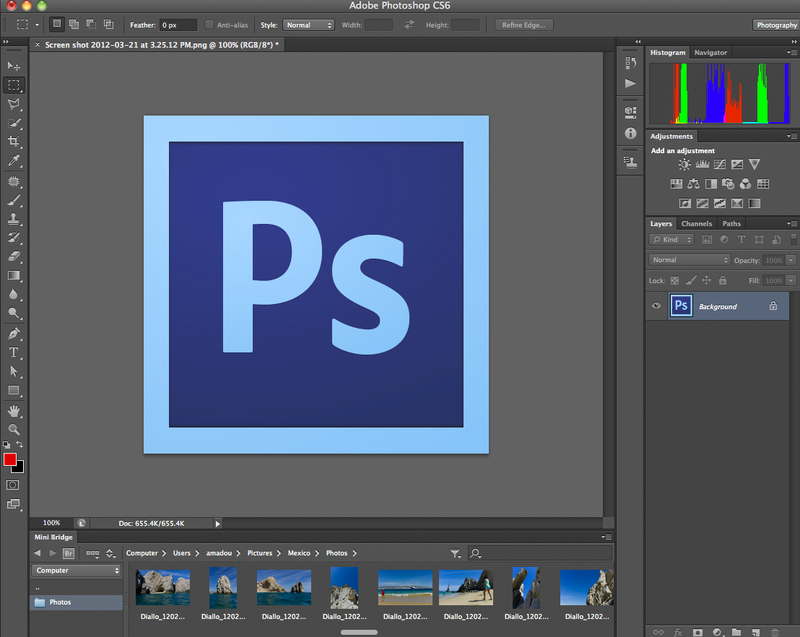 Photoshop CS6 launches with the Application frame enabled and an interface design that features light text on a dark background. By default, CS6 offers a much darker background palette to surround your image than previous versions. A number of icons have been redesigned and Panel names are now displayed in sentence case rather than all caps. In the screenshot above, look carefully along the bottom left (highlighted in red) and you'll notice two tabs; one for Mini Bridge and the video Timeline. Clicking on either will extend the tab up into a filmstrip-style panel that runs horizontally beneath the image area. You do have a number of options for changing the UI color scheme by going to Preferences>Interface. The most crucial of these, in my opinion, is the ability to set the Background fill and Application frame colors independently. In each of the examples below I have set the Background fill to medium gray while changing the interface color among four available presets. Note that you can also choose a custom color for each. Black interface with medium gray Background fill. Dark interface with medium gray Background fill. Medium gray interface with medium gray Background fill. Light gray interface with medium gray Background fill. With CS6 you can also display 'rich cursors' that show contextual information such as dimensions, angle of rotation or other adjustment parameters right alongside the cursor, as shown in the example below. The rich cursor information is context sensitive. When using one of the marquee tools you can view the dimensions of the marquee you're drawing as well as the XY coordinates of its location. You can also specify where this information is displayed in relation to the cursor. In the example shown here, I've set it to display along the bottom right edge. Arguably one of the most important additions in CS6 is Photoshop's ability to automatically save your open document(s) at user specified intervals. In addition, you can have Photoshop perform all of its Save operations in the background. When editing large files this allows you to continue working after hitting 'save' instead of waiting for a progress bar to complete. 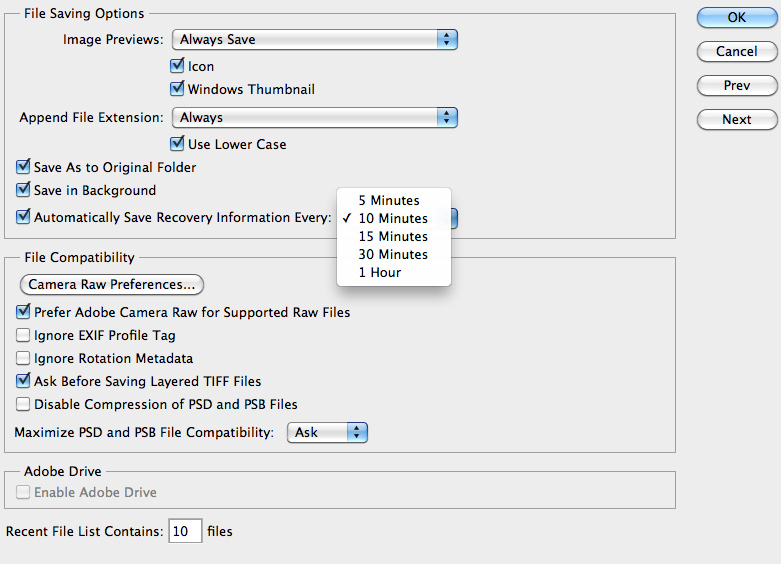 You control the behavior of the Auto save in Preferences>File Handling. 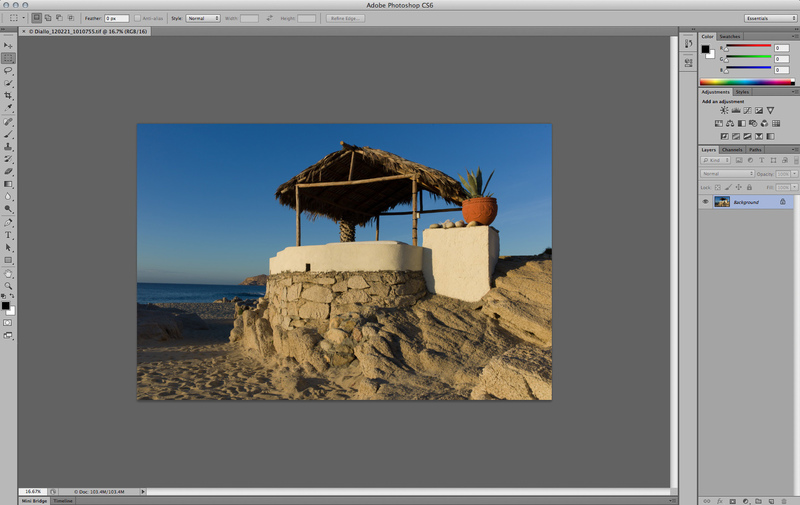 A pop-up menu (shown above) allows you to determine the interval at which Photoshop saves your work to a recovery file. In the checkbox above this one you can also have Photoshop perform all of its Save operations in the background. As you work, Photoshop creates a temporary recovery file on your hard drive that updates periodically to reflect the current state of your document. Should Photoshop crash with your document in an unsaved state it will, upon relaunch, open a document with '-Recovered' appended to its name that contains the most recent auto-saved version. It's important to note that the recovery file is a separate document from your working file - it doesn't over-write the last point you intentionally saved. The recovery file is deleted whenever you invoke a Save or Revert command or close a document without saving. Can you believe I'm still using CS2? (gasp; shock; horror). But with almost a thousand extra plug-ins, brushes and whatnot downloaded from all over, it still going quite well for me. In other words, use what works best for you, just don't use something new for the sake that's it's new. I tried CS6 and yes, it's wonderful to use, but I still wonder what REAL difference it makes to my business sales. After 5 month Adobe release an CS6 update according to Adobe this fixes 76 major core issues in Photoshop. Ask yourself why did Adobe release CS6 with over 76 major issues in the first place? Long time Photoshop user are still having problems after the CS6 update. Some have reported the update introduced additional bugs. Will Adobe ever release a reliable version of again? Adobe has not been able to fix the last three releases of Photoshop. Adobe just seems to be adding new features and bugs. Features like content aware distortion. The sad part is there is no good alliterative to Photoshop so Adobe can get away supplying their customers with bug infested software. Some interesting comments from other users ! For me 90% of my time is spent in ACR and the other 10% in PS. Very rarely can I take a photograph that does not require some tweak in ACR and it's a pity Adobe don't sell a Basic Photoshop program for a nominal fee with additional blocks that could be added depending on your requirements. It does seem silly to charge this much for a software when most people will only use a small part of it. Those people running a Business may well need the full version but private individuals often need only a small part of it. I just bought an iMac and have installed a trial version of Illustrator CS6 and when I try to use the revolve tool, it gives a message that there is not enough RAM. It did the same with CS 5.5. I already contacted Apple through customer service and looked up information on their site; my processor should support this application and or/operation. Is this an Illustrator problem? Is it the same with CS4 and earlier? This iMac is 64 bit. Thanks. I should also mention that the program often hangs on startup and even killing the task and attempting to restart fails. When that happens you have to reboot. If you search google and adobe forums you'll see this is a pretty common problem. What plugins don't work? I'm using portraiture, Nik, Topaz and perfect portrait though onone software either didn't work or I need to reinstall it. For the other plugins, all I did was copy the folders over from my CS5 installation. the content-aware move, extend and patch are utter crap. They plain don't work on 21MP Canon 5D MK II files though they seem to work great on web sized images. And they've wrecked the patch tool. Even in normal mode it doesn't work properly. I have to resort to CS5 when I want to use the patch tool. Before you decide wait and see how the full version is. A lot of the time they don't allow full compatibility and integration in trial versions. The full version may have what you need. I tried it but won't be buying it. Problem: It accepts not a single of my favorite plugins. More crazy talk about Photoshop. I thought in 1970 I was hearing too much blather from folks in college yapping about their Nikons, Hasselblads and Leicas. Photoshop is a great tool in the hands of an artist/technician. Yes, I would love to upgrade. PS is ok , but my view point is very simple , PS to me is an excuse not to buy better equipment , i personally would rather have the best equipment than there is no need to waste my time in PS , i have no need to go to Photo Shop , my pictures look great like they are , and those who waste time there should just upgrade there camera , better yet take better pictures! What raw extraction software do you use, or are you shooting film? I find not quite believable that you don't have adjust things like say vibrance or curves--okay you could use GIMP for curves. I want to see proof that you take fine pictures without photo editing software, post them to your gallerie! yes, exactly what I used to say before my photoshop course. now I know how to use photoshop my pictures have gone to another level. Kampbyll Photography, that’s the silliest reply I have seen in years. I am with CSImagery.....please show us your perfection to back up your words. Hummmm I wonder why Photoshop is the industry standard for photographers all over the planet? It must be because all those professionals don’t know what they are all doing. Educate us.....show us your mastery. I agree with all replies above. I am not a Pro-photographer, but I saw so many demonstrations, videos and tutorials that you can shoot superb pictures using an entry level DSLR. Upgrading your equipment doesn't make you shoot great photos. It's experience, talent, a bit of luck and Photoshop that make you create great photos. There are also so-called purists that reject the use of software for the sake of authenticity - this is a topic worthy of another discussion and IMO this approach is too simplistic as these "purists" don't realize what's going on onside the camera anyway. If you're one of them, this discussion is pointless as this is similar to religion. If you're not one of thew "purists", I hope you do some local image adjustments. Of course, there's other software besides PS - but none of it combines the power, convenience and output quality of PS. If you don't use *any* image editing software and not one of the "purists", then you're missing about half the image creation possibilities. As simple as that. Kampbyll Photography... I know this comment was made 6 months ago, but I have to say... You are an idiot and clearly don't understand the first thing about the choices you need to make to bring your work alive. You can read what I wrote in the Adobe Forums here: http://forums.adobe.com/message/4290725#4290725 The title of the post says it all. Stop whining while you shoot. The rest of us will advance our craft by using photography tools as intended, and paid-for state of the art software like CS6. Un-shake? Sounds to me like a video function. I cannot imagine that you can unblur images... Well in fact you can ... to some extent by sharpening. Do you know Babylon? A nice little translator? It started off as a free software, then you needed a license. And today the upgrades are so INSANELY expensive, that I stopped using it. Adobe must be careful that they do not force the market into alternatives. Aperture/their own Lightroom/OnOne... There are excellent alternatives out there for people who used to buy PS, but do not use it to its full extent. The hundreds of $$$ for this CS5-CS6 upgrade is not worth the money for that group if you ask me, but they kind of force you into this upgrade, through their policy to only allow upgrades at a "reduced" price from the previous version. It does not feel comfortable to me. I think CS5 is the last version I will use and I will start looking for alternatives, like plugins for Aperture/Lightroom from Nick Software/OneOne. I agree in some extend. PS is getting more and more expensive and more and more powerful and complicated and I think a lot of users don't even scratch the surface of what this software can really do, but I tried several alternatives (Aperture, Lightroom, some lesser known applications) and I always come back to PS because there was always something missing in the alternatives that I got used to in PS. For example HDR. Lightroom doesn't have built-in HDR processing. Sure you can get an extension, but that didn't work for me as good as the built in HDR in PS worked. I guess it all depends to what extend you use post production software. Свободный бета, скорее всего тайм-аут и прекратить работу раз CS6 поступает в производство. I was hopping that the newly proposed workflow for working with out of focus photos would be part of CS6, but I see they did not included in this version. I wonder why, since they already have it working. I saw demonstration on it and it was awesome result. "The ability to refocus out of focus images"- theres an interesting marketing pitch. In order to do that you would need the exact construction of the lens - not just which type lens it was but the exact lens used to take the image , the exact distance to the subject to a fraction of a millimetre and the exact place the lens was actually focused and the computing power of a small country and a great deal of time. I would settle for the mac version of CS6 to put the colour variations feature back in which has just been a blank in the menu since it went 64bit. I think the technology refered here is the multiple lens adapter, taking the same picture at different focus areas. The disadvantage of that is that you will need multiple chips (one for each lens) or a very high res chip. I feel messed over. I wish these folks give the market a shot at learning what is out there now. These school won't be able to manage with the upkeep of charge so fast. There are a lot of reasons to buy upgrades... since PhotoShop 2! Given the fact that this is a beta version, is it really necessary for Adobe to hit me with an invitation to licence the program or continue a "trial" every 30 seconds or so? This was irritating enough for me to stop using CS6. In it's 22 year existence Adobe have been very snobish in what they would change in the PS UI. It was considered too plebian obviously to have dedicated buttons along the main top toolbar or attributes bars buttons like; Print, Copy, Paste, Undo and Redo etc. I am a great believer and user of KBD shortcuts, but in 2012 we still have to go to Image/Rotate Canvas! * Update the Lens Flare and Lighting filters! Is that expecting too much from the "Market Leader" O.K. let the brickbats start flying. I didn't notice many reasons to upgrade to CS4 or CS5, but now upgrading to CS6 is really important. Sera cuestión de probarlo ,gracias por toda la información. atlas adobe added an auto save feature in photoshop.this will be a very helpful feature for recovering if the app quit unexpectedly. great autosave while working on a 1gb file so your computer will be constantly stuck! just make a save or "save as" part of your workflow! not a real feature worth the money though! Thanks for this very informative summary of CS6. Wow, a docking toolbar, after only 24 years of asking. hope they changed more than cosmetics, specifically, making you not dig down in the menus for constantly used functions that can be done instantly in other software. The long Abandoned Picture Publisher software may not have been better, but it sure was always speedier. I only go into Photoshop for major operations, cause for most things, its too cumbersome and slow to load. But then, I generally feel Adobe UI's are backwards and counter-intuitive, with the exception of Go-Life, which interface they ended up axing for the horrible Dreamweaver interface they bought from Macromedia. Can you copy a transparent image from another app and paste it to PS and it is still transparent? I have been using PS since version PS5 and these things are still there, arent they? Or maybe im just stupid and never learned to use it. Most people don't need right-click in Photoshop to copy and paste, because copy and paste is usually not the best way to do it. Usually it's better to make the selection and float the layer, since it takes less memory for the same result and is more flexible anyway, since you can now use the selection as a layer. As far as copying transparent images from another app, much of that happens outside Photoshop. If the other app copies the data to the system clipboard in a transparent format, and the system clipboard can preserve that transparent format, Photoshop should take it in that way. But many other apps may handle this incorrectly. The GUI finally looks nice in CS6, but I dread the bloat of upgrading to it. Don't need or want video editing in PS because other dedicated programs are better. Tired of having to upgrade the computer because of Adobe's PS bloatware version to version. Can you snap object centerpoints to guides yet? Been wanting that feature for ages. I guess it is start to upgrade from CS3 now. Hope they release the whole CS6 packages soon (at least as long as I am going to be student :-)). Are you thinking of FocalPoint from OnOne software? I do. It is pretty easy to use and creates realistic out of focus areas. I have not figured out how to be very precise in determining what is in focus and what is out of focus. Maybe I just have not worked enough with their "masking bug." I have not tried the CS6 blur filter yet, it appears that it might be a little easier to control than the OnOne version. Amen to that. It's part of the sport. Some people like only one or two parts. I like most of it (and I used to play with a lot of stuff in my darkroom). I upgraded from CS5 to 5.5 (entire Master Suite) and have been delighted. I just upgrade my 5D to a MKIII and I love that dimension as well. I recently upgraded to CS5 from CS3 when Adobe announced no upgrades unless you had the previous version. I was waiting for CS6, but under this policy I would be ineligible. What's the upgrade policy now? I don't think I'll being paying another $200 this soon. I would rather wait for the CS7. Adobe had such a huge backlass they will allow upgrades to CS6 from CS4 and earlier versions. But starting now you have to upgrade every time to be able to upgrade at upgrade prices. If you do not upgrade to CS6, when CS7 comes out you will have to pay full price to get it. That blur tool example above is teerriibblle! So fake looking... I'm sure some add'l feather might be needed? I have stopped using Adobe Photoshop for sometimes, LR is all I need. Pretty stupid for a photographer not knowing what can be achieved with masks and channels. Could make your images look 1000% better. No need to be rude! Sheese to each his own. I heavily process most of my "good" pictures and I really like what Photoshop can do but I know that some very good photographers can generate better pics than I do by just using LR. Just a photographer .... More like just a wrongly opinionated fool! Each to their own, but only idiots criticise others because they do things in a different way to themselves! what kind of a crappy photographer are you that you can improve your photos with photoshop 1000%? To: Just a photographer... Where have you been? You can use layers (plug-in is called "Perfect Layers" from OnOne) in LR. Well, this is great news for Scott Kelby and Martin Evening. What I would like to see is a filter that takes wildly overprocessed HDR shots that look sort of like a painting but not really and turns them back into something that resembles a photograph. But to each his own. I'd also like a gauss blur for my deconvolution algorithms (discussed below) but first I have to find out what that means. Seriously, if this has something as useful as content-aware fill, then I'm interested. You will never be able to take back over processed files to a normal level. There is too much information that has been destroyed. i'm not seeing a whole lot that's compelling. 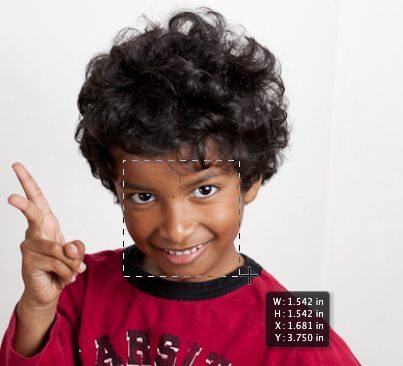 The content aware fill that dpreview demonstrated looks flawed. I see the outline of the original selection. The selective focus example looks horrible. I'm sure it works better than the dpreview demo. Dpreview ought to hire some professional artists and photographers to do their reviews. Oh, Come On! You think you better... I don't wanna be rude but, please, go jump out the window! jump out the window? really? that's kinda over the top isn't it? Wasn't there a note saying that in most cases you need to rework the fills! You jast need to figure out what will be more expensive. Seriously!? I just bought CS5....didn't CS5 just come out? I feel like Adobe has taken the same model as Capcom. This is like Super Photoshop 5 Arcade Edition....I wish they would just support the product that is already out. If by "just came out", you mean, "came out 2 years ago", then yes. Do you know Babylon? A nice little translator? It started off as a free software, then you needed a license. And today the upgrades are so INSANELY expensive, that I stopped using it. Adobe must be careful that they do not force the market into alternatives. Aperture/their own Lightroom/OnOne... There are excellent alternatives out there. The hundreds of $$$ for this CS5-CS6 upgrade is not worth the money if you ask me, but they kind of force you into this upgrade, through their policy to only allow upgrades at a "reduced" price from the previous version. Will the new ACR / Lightroom have a pattern noise suppression tool? I think I read that the new "moire" parameter in the gradient and adjustment brush may be used for pattern suppression. yeah ok this is about PS not 0$ tools, go make your own thread buddy. Renting car for weekends and saving the repair costs. Buy a ferrari and drive it on weekends. @ppage, you should spend your money in becoming a better analogist, haha. or stop pretending you can come up with one. Could someone tell me, if I have CS5 Extended can I upgrade only the Photoshop to the CS6 version thus paying GBP 125 instead of GBP 252. I do not need the upgraded version of the rest of the suite. Thanks. @Kirppu: What are you doing for your living? And would you ask Canon or Nikon to offer their cameras for free! is it fully functional? can you save your work without watermarks? will only expire when the final product launches? If it's okay to ask, how would the beta "know" it has expired & lock down, unless each time it launches it checks online for status & won't launch until it is successful in doing so & the status gives it the go-ahead? It will also check your system date. I'm sure they have a "maximum life" and a "latest date" already encoded in the beta, which would take over even without internet access. Any changes to Bridge? Such as increased speed? Bridge is 64-bit now. Should help with large numbers of images. I can see that oil paint filter being a lot of fun. I'll use it for making comic books as it looks more cartoon like than oil paint like; IMO. Does quantitative imaging analysis means it will benchmark an image for noise and color saturation like DXOMark? thats why they sent me the postcard last week promting me to buy CS 5.5 so they can charge me me agian few months later for cs6. Anyone notice you can see the outline of the original selection in the content aware patch example with the ducks??? Ask Adobe. After announcement done, upgrades are normally for free. The new contentaware patch tool is very useful for areas which needed masking to be properly filled in earlier versions of PS. Adobe has released Camera Raw 8.2 and Lightroom 5.2, as final versions of updates that were originally posted as 'release candidates'. ACR 8.2 is designed to work with Photoshop CC but, as promised, is also compatible with Photoshop CS6. It brings support for 16 additional cameras, including the Canon EOS 70D, Fujifilm X-M1, and Sony RX100 II, along with new lens profiles and bug fixes. 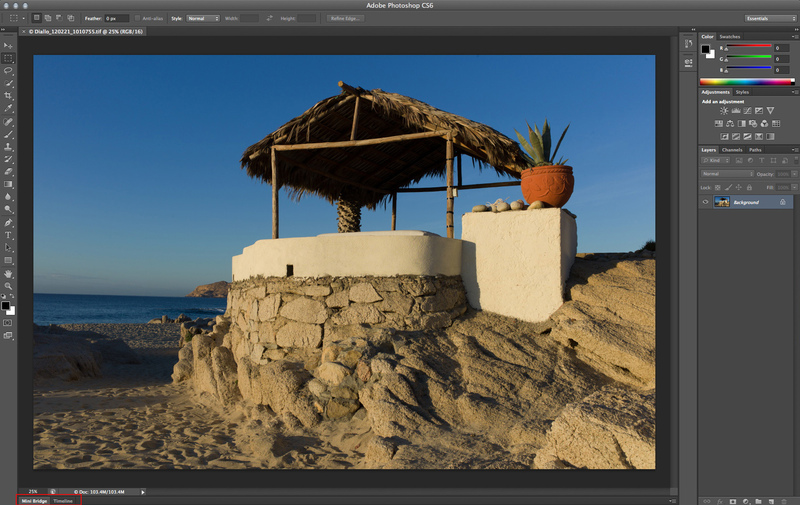 For users of older Photoshop versions, Adobe DNG Converter 8.2 is also now available. Click through for more details and how to download. Adobe has released Camera Raw 8.1 and DNG Converter 8.1, as final versions of updates that were originally posted as 'release candidates'. ACR 8.1 is designed to work with Photoshop CC but, as promised, is also compatible with Photoshop CS6. It brings support for 7 additional cameras, including the Olympus PEN E-P5 and E-PL5, Ricoh GR and Panasonic Lumix DMC-G6, along with profiles for 16 more lens, including Sigma and Zeiss's latest models. Click through for more details and how to download.